Every October, people from all over North Carolina — and beyond — head to one place to be reminded of why they love the state. 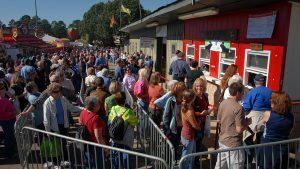 This year, the North Carolina State Fair could draw more than 1 million visitors across its 11-day run (Oct. 11-21). There are over 120 rides and dozens of games on one of the largest mobile midways in North America. 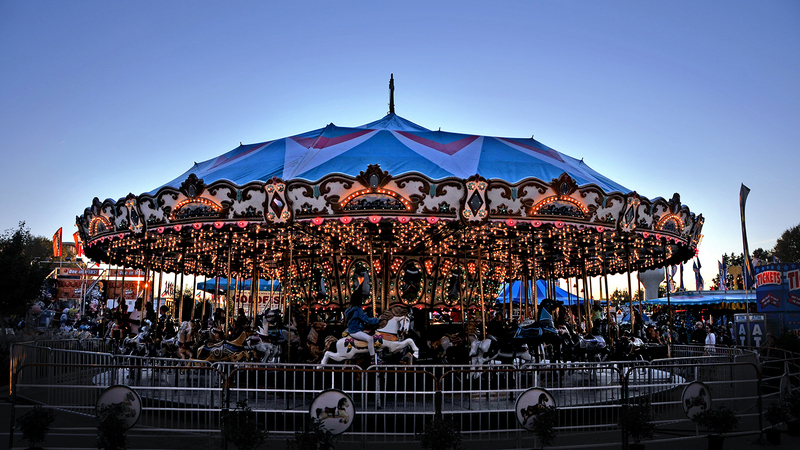 Lumberjack shows and alligator wrestling during the day will give way to rainbow-lit rides and live music at night. Mountains of fried novelty foods will be consumed: Expect deep-fried Oreos, Krispy Kreme burgers and barbecued-chicken cheese fries. Hundreds of shiny jars of pickles and preserves will be tasted and judged. 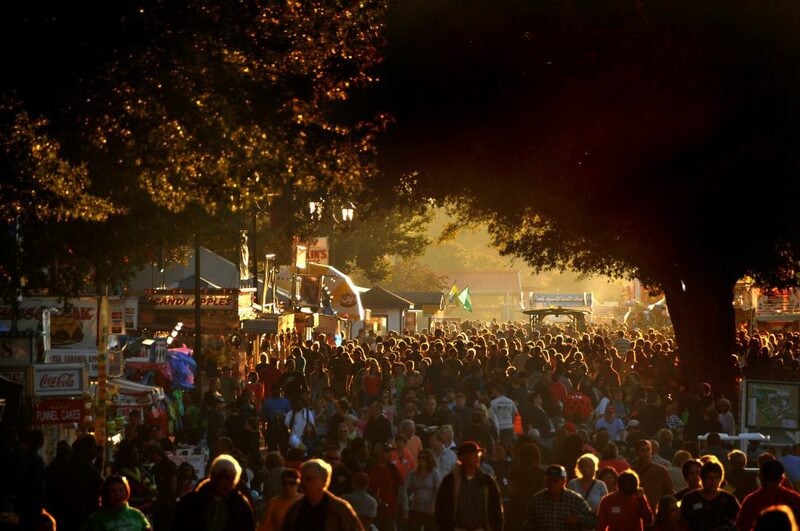 The late afternoon sun cuts across the crowd at the state fair. While the state fair has changed remarkably since it began in 1853, what stays true is NC State’s connection to this annual celebration of all things North Carolina. 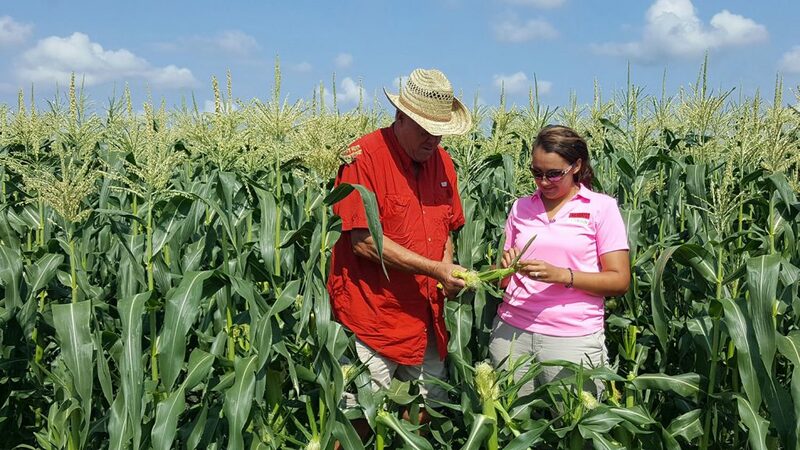 We’ve always had a hand in spreading knowledge and prosperity across the state, particularly when it comes to North Carolina’s main economic booster: agriculture. And while the university shines in that field during the fair, there are plenty of other surprising links to explore. 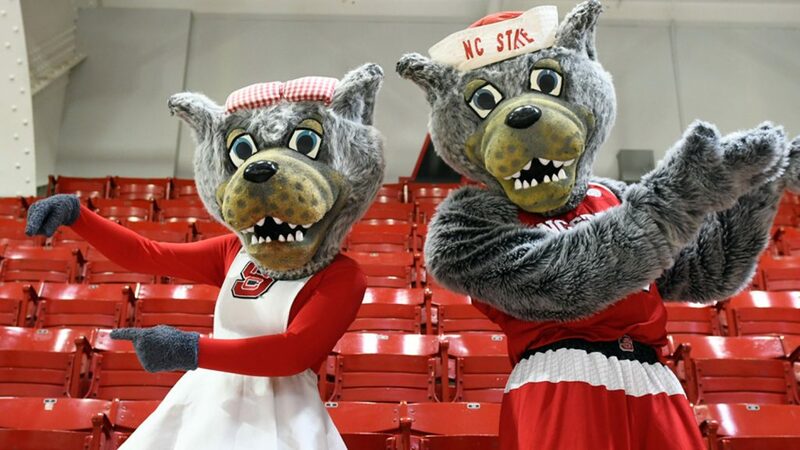 Take a look at six connections between NC State and the state fair, and get your taster ready for a blockbuster year. Fairgoers wait in line for Howling Cow ice cream. October weather is unpredictable, but the demand for Howling Cow ice cream is steadfast, whether the sun is scorching or a cold rain is cutting across the turkey shoot. Veteran fairgoers recall the line for this stuff stretching all the way down the midway. After two years of the mega-popular caramel apple crisp, fans are salivating in anticipation of this year’s new exclusive flavor: key lime pie. Classic choices are available too, like strawberry, chocolate and Wolf Tracks. The Howling Cow ice cream booth is staffed by students in the NC State Food Science Club, who take turns scooping in three-hour shifts. Proceeds go to the club for community outreach and professional development. Howling Cow business officer and Associate Director Carl Hollifield estimates that the club serves more than 4,500 gallons of ice cream during the course of the fair. Also of note: Members of the NC State Dairy Science Club work alongside the North Carolina Dairy Producers Association to introduce fairgoers to all kinds of cheeses produced in North Carolina. American Aquarium. Photo credit Cameron Gott. The fair hosts more than 120 live shows across three stages in 11 days. The biggest names perform in Dorton Arena, which seats 5,000 people. North Carolina native and NC State graduate Scotty McCreery brought down the house in 2013 with his fair performance. 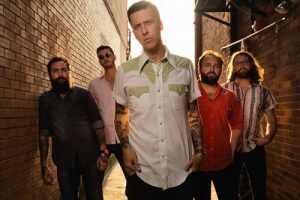 This year, look for concerts by a handful of NC State alumni, including alt-country favorite American Aquarium on Oct. 11 and the comedy duo Rhett and Link on Oct. 12. All shows are free with fair admission, and seating is on a first-come basis. Check out the full Homegrown Music Festival lineup. J.S. 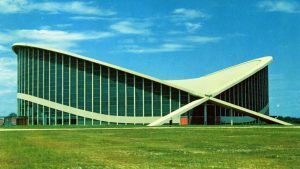 Dorton Arena, as seen in a midcentury postcard. Image courtesy of NC Archives. Many know Dorton Arena as the spaceship that landed in the middle of an otherwise ordinary stretch of fairgrounds buildings. This midcentury masterpiece was designed by Polish architect Maciej Nowicki, head of NC State’s School of Architecture. Though Nowicki died in an airplane crash before the building was constructed, he left detailed sketches and plans for the innovative parabolic structure. 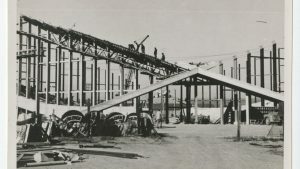 It was completed by local builder William Henley Deitrick in 1952. Prize pickles and preserves. Photo courtesy NC State Libraries. What makes a jar of pickles or preserves worthy of a blue ribbon? Is it tang, crunch, spreadability or magic? Ask Ben Chapman, associate professor and food safety specialist at NC State. 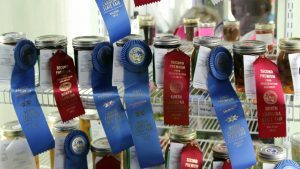 He’s served as the superintendent of food preservation competitions at the fair since 2010, after NC State faculty member Carolyn Lackey retired and passed the tasting spoon. 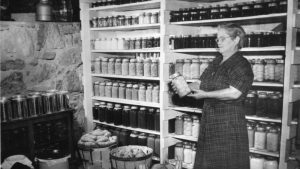 Food preservation display at a State Fair long past. Photo courtesy NC State Libraries. With his handpicked team of 20-25 judges, Chapman oversees the judging of anywhere between 900 and 1,400 entries over two days. Judges look first at the entrants’ recipes, then acidity levels, product appearance and, finally, taste. Working in teams of two, they provide each entrant with personalized feedback and comments. It’s a monumental task. Chapman’s department at NC State, Agricultural and Human Sciences, has been involved with the fair since the 1920s, and some of his judges have been at this for more than 50 years. Buttons from the Language and Life Project display at the state fair. For the ninth year running, the North Carolina Language and Life Project (LLP) will have an interactive display at the fair. 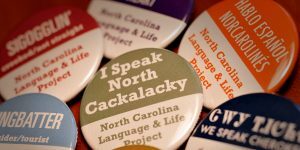 Walt Wolfram, William C. Friday Distinguished University Professor of linguistics in NC State’s English department, and his staff and students will hand out “I Speak N.C.” buttons to patrons who take part in their interactive display of dialects from around the state. With audio from native North Carolinians, the display encourages fairgoers to guess where folks are from based on soundbites. The booth benefits from the steady stream of people visiting the Kerr Scott Building. Most years, they give out more than 10,000 buttons. 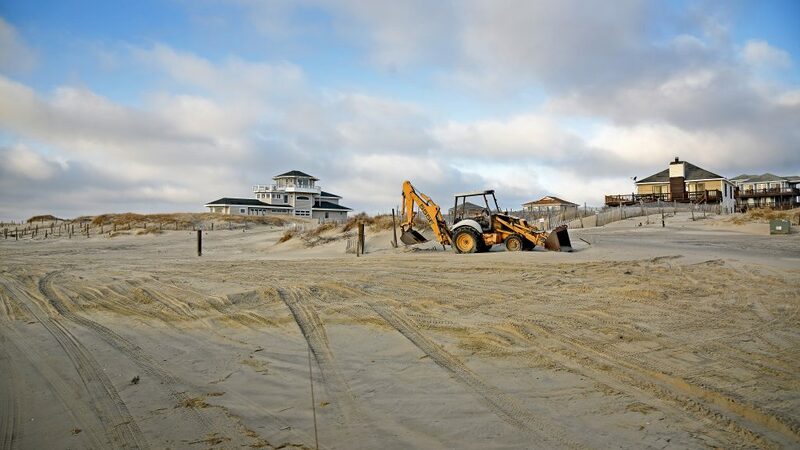 “Now that we’ve been there for almost a decade, many people count on seeing us,” Wolfram says. About 40 students staff the booth over the course of the fair, working in four-hour shifts. Many get to engage in research by asking visitors about their hometowns and the kinds of phrases they grew up hearing or speaking themselves. 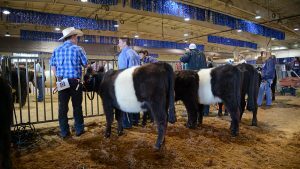 Young farmers chat as they wait to show their Belted Galloways at the state fair. The College of Agriculture and Life Sciences (CALS) plays a huge role in the state fair. Students and faculty help with everything from judging contests to mucking out horse stalls. There are numerous 4-H and Cooperative Extension displays around the fair, from decorative hay bales near the gates to exhibits for family programming in the Education Building, as well as county exhibits and crafts, photography and entomology exhibits. NC State Animal Science Club members will serve as ringmasters at livestock shows in the Jim Graham Building and the Exposition Center. Members of the Animal Science Club also work at the extremely popular cow-milking booth — and at the State Fair Ark, which displays more than 60 animals representing North Carolina’s diverse livestock industry. Turkey poults await pickup by Youth Market Turkey Show participants. 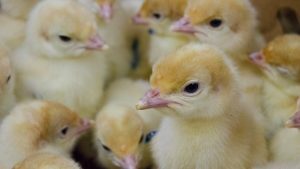 If you’re with kids, don’t miss the “Hatching in Action” booth, where visitors can see live chicks hatching all fair long. The Poultry Science Club also helps with the Youth Market Turkey Show every year. Ever seen a quarter-scale tractor? Check inside the Antique Farm Machinery Building. Members of the Pack Pullers club from the Department of Biological and Agricultural Engineering will be there with their painstakingly built miniature. Not to be missed: the Flower and Garden Show, a wonderland of flora and horticultural artistry. Look for information booths and exhibits from Extension Master Gardener volunteers and NC State’s J.C. Raulston Arboretum. Both the agricultural commissioner, Steve Troxler, and the fair manager, Kent Yelverton, graduated from NC State. Yelverton is excited for his first year as state fair manager, though he’s hardly a novice around the fairgrounds. He’s been an engineer with the NC Department of Agriculture and Consumer Services for 26 years. And he’s no stranger to the special relationship between NC State and the state fair. Purchase advance tickets online or at your local Food Lion. You’ll save time and money. Parking can be a challenge, especially on the weekends. Fair administrators encourage everyone to use mass transit when they can. A park-and-ride lot at the corner of Reedy Creek Road and Edwards Mill Road will have a free shuttle bus running to Carter-Finley and the new pedestrian tunnel, near gate 8. 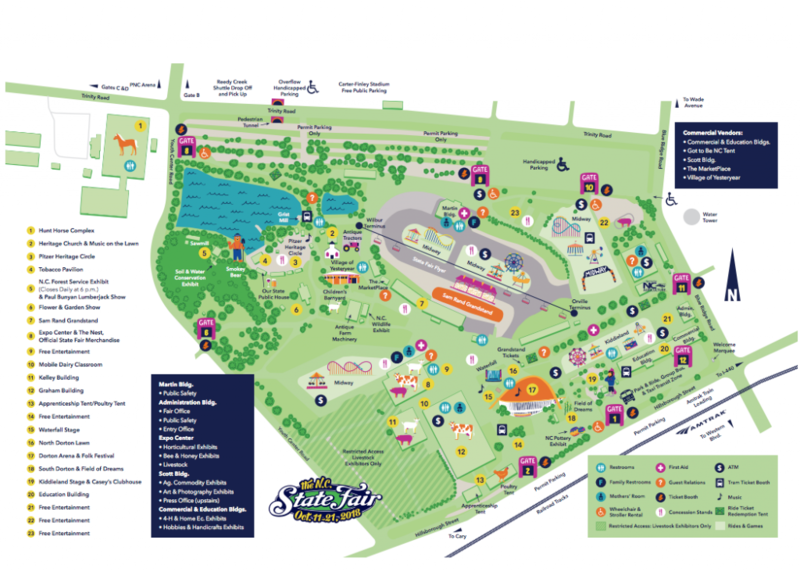 A map of this year’s fair attractions. You can ask in your local 4h. We usually get ours in june but we also have to order them way before. $10 for 3 poults and a gallon bag of feed. This is a great article. I love NC State!! Go Pack!